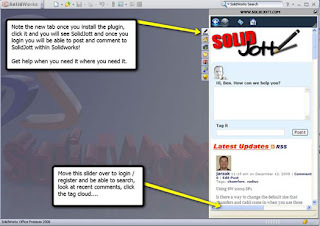 A couple of weeks ago SolidJott Launched an Addin for solidworks aiming to get your questions and issues answered fast, online. Today They announced that it’s available inside SolidWorks 2009. It is an direct access to the collective brainpower of SolidWorks users worldwide.It’s absolutely free and available for download here (796kb .zip). It’s quick. It’s convenient. You can type a short question about an issue you’re having, submit it and everyone else immediately sees it.We can then communicate with some of the top experts in SolidWorks community right within SolidWorks.We can comment and rate other people questions also. It’s a lightweight add-in that allows you to interact with SolidWorks users without leave your work or your issues. Future developments of solidjott Add-in will include a button to send a screen capture to the post and a button to ‘pack and go’ the file(s) we are working on currently and send to post to make things even easier in describing problems or solutions. For more Info Check out this Video.